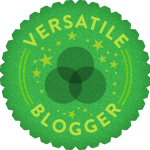 I have been nominated for the Versatile Blogger Award! I would like to thank Nadine, Diamond, and Cecily for the nomination :). These ladies have some fantastic blogs, be sure to pay them a visit. 1. I am all about sleep. I can sleep whenever and wherever lol. 2. Law and Order SVU is my all time favorite show. 3. I love greek and roman mythology. 4. I would love to visit Greece someday <3. 5. I don't really like chocolate that much. 6. I thoroughly enjoy techno and think it should be played more often lol. Also, I know I have seriously been slacking on posts, my life has just gotten unexpectedly hectic :/. I will be stepping my game up for October though, including a giveaway for birthday month! Hahahaha I am COMPLETELY with you on your first random fact!! And thanks for the nomination!! lol! sleep really can't be beat. you're very welcome, love your blog! !